Back in the day I used to be obsessed with Juicy Tubes. The must have make up of the early noughties. In fact, it’s where most of my student loan went J Back in the day, we didn’t have a lot to choose from. No chubby sticks, lip butters, cream puffs, matte crayons etc. At school there was Rimmel Lipstick (Heather Shimmer anyone?) then by college/uni we upgraded to Juicy Tubes. It makes me laugh when I look back now. 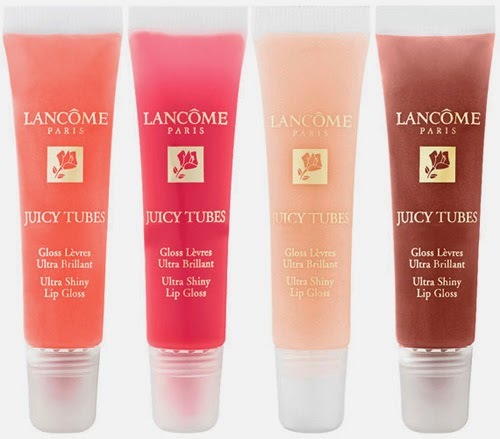 They were pretty sheer, sometimes glittery and way too sticky – impossible to kiss with, but man did I feel sophisticated with my Lancôme Juicy Tube. It was the era of Paris Hilton and Legally Blonde afterall. Framboise, Marshmallow, Fraise, Lychee... I loved them all. Juicy Tubes are still available (RRP£16.50, £10.50 All Beauty) and I’m sure they’ve improved over the years but I’m more of a lipstick gurl these days and if I fancy a gloss, there are better ones to choose from like Revlon Colourburst/Super Lustrous. Gone are the days I spend nearly twenty quid on a tube of jelly. But Juicy Tubes will always have a special place in my heart and I still have a couple of nearly empty tubes I can't part with. Are you/where you a fan? I laughed aloud when you mentioned Rimmel's Heather Shimmer - I was all over that colour as a teen! Loved that lipstick colour so much and only remembered this when I read your post! Hahaha I was a Lancôme juicy tube whore too! I hauled loads when I went to NYC about 12 years ago! Also I was a Fudge Brownie girl - but the skinny Rimmel lipstick - remember them?? Bobbi Brown's rose gold shimmer lol colour is exactly the same I'm sure!